The smoke and ash of Baltimore has cleared in the magical land of cable news. With protests in Cleveland underway, the short attention span of corporate media discourse has found another tragedy to focus on, with many talking heads treating yet another “isolated” incident of police brutality as just one more link in an unending chain. However, as Baltimore’s residents clashed with the police in the streets last month, another minor spectacle was underway in the city. A spectacle that captured perfectly the economic forces and social problems that kindled Baltimore’s flames. Photo posted to Twitter by Washington Post columnist Clinton Yates. Indeed, that this happened in Baltimore is interesting. There is a long history of racial unrest and a legacy of mistreatment in the city. The famous TV show The Wire has popularized many of these views and situations for us outsiders. Like Matt Welch of Reason.com hinted, Baltimore is also notable for its role and position in the recent trend of stadium construction and relocation. Oriole Park at Camden Yards was the first of the retro ballparks built downtown. Like many of the other stadiums it was built in part to inspire urban renewal and redevelopment. The Cornish Company led the way and built the nearby Power Plant Live! entertainment district. Camden Yards opened in 1992 and since then dozens of new baseball stadium have been built (with large public subsidies) in urban centers, leaving behind their previous multipurpose structures that were often located near highways and suburbs to allow for parking and tailgating. Legions of scholars have illustrated that stadium subsidies are a bad deal for taxpayers. The events in Baltimore, however, hint at other, non-economic, ramifications of these new stadiums. Outside of the commentary on the uniqueness of the situation, and the problems of tax breaks for wealthy enterprises is an even larger issue of what happens when private entities control avenues of the public sphere. The concept that sporting arenas, like ballparks, are a central place of the public sphere in urban areas is not a new concept. Gunther Barth in City People: The Rise of Modern City Culture in Nineteenth-Century America listed ballparks specifically as one of the main ways disparate urban populations forged common identities in industrial cities. Steven A. Riess has also explored the connection of sports to urban areas in City Games: The Evolution of American Urban Society and the Rise of Sports. Likewise, despite the popular ideas that sports arenas are “apolitical” spaces where people simply go to relax, many historians who study leisure and sport can attest that it is precisely the mass appeal of athletic contests that make them such a powerful tools to study social phenomena. Yet, the new ballparks built with public money, present a different narrative. They’re not actually these democratic and apolitical spaces that welcome entire communities. Instead, the ballparks like Camden Yards and the dozens of others inspired by it, have become symbols of re-gentrification. As Temple PhD student Seth S. Tannenbaum wrote on his blog recently, these urban stadiums “are meant to feel as though they exist within the city without actually carrying the full experience of the city. They are meant to be spaces where fans are protected from ‘risks’ and discomfort. 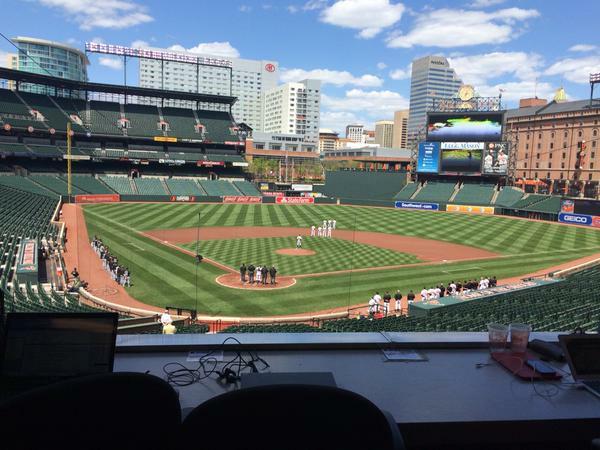 In Baltimore, on Wednesday, the only way to preserve that fantasy is by keeping all the fans away from the stadium. That, I think, says a lot about why calling positive attention to the grave problems in American cities has been so difficult.” This, according to Tannebaum, is because “the new wave of ballparks built in the 1990s and 2000s were in or near African American neighborhoods, but they were strategically separated from those neighborhoods.” Closing the stadium is a part of this deliberate decision to separate Camden Yards from the seedy urban area it belongs. The idea of not having fans, in some ways seems to be a way of punishing the fans and the city. In one regard it appears to be MLB saying, “we don’t need you. We know better, and will keep you safe by prohibiting you from coming to the ballpark”. It’s classic paternalism. After all, no one wants to risk driving downtown and parking for a 3-hour game and then coming out to find their car destroyed by rioters. Nor do they want fans to leave the park at night, perhaps after the curfew, to find the streets flooded with rioters enacting violence. They see it as a safety issue. But if this is true, then it means that MLB sees its fans as different. They don’t live in the local neighborhoods. They’re not demonstrators or “rioters.” Those people are someone else. Those are violent and upset urban dwellers, not baseball fans. They are people that Orioles fans need to be protected from. As result, the league convinced itself, and those in the media, the stadium was not a safe space where fans could leave chaos behind but instead a potential target. Photo posted to Instagram by NBC’s Oliver Cox. These not so subtle declarations of who matters and who doesn’t, who is a fan and who is not, highlight the problems with a public sphere controlled by an economic elite. They highlight some of the major problems of re-gentrification and increasingly blurred lines between race and class in the urban core. In some ways, it might also be indicative of MLB’s “Black Problem” that Tyran Steward wrote about earlier this month, because the Orioles and the MLB clearly seem to be scared of their own neighborhood. Avoidance is par for the course. We’re often told to ignore and steer clear of the “bad areas” when we visit a new city. That’s precisely why so many Americans are confused about the problems that precipitated the riots – they avoid uncomfortable narratives about our nation’s past, conversations about current events and politics, and bad areas of town. We’ve been conditioned to turn the other way and wait it out until the momentum and energy has fizzled. MLB did much the same with its moving of the games and refusal to let fans in. They couldn’t run the risk, not when there are “liabilities” everywhere. The disconnect between the team and the neighborhood is also indicative of the reorientation of public space, and how its used, in modern America. Private owners have seized spaces and taken charge of determining when and how they can be used, regardless of if they were paid for by tax subsidies and supported by the state. From Occupy Wall Street to BlackLivesMatter, one of the things the protests of the early 21st century have shown is the power that comes in occupying and controlling public space. The Arab Spring in Egypt was a similar example, where revolutionaries depended heavily on using Tahrir Square as a symbol of the revolution’s vitality. As countless Egyptians fought with authorities a strong statement was made. Controlling public spaces, however, allowed certain interests to impact the development of current events and affect the narratives circulated in the new cycle. The events in Baltimore also are illustrative of how a private entity is able to establish and control public narratives as well as public spaces. While baseball certainly didn’t make the Baltimore situation anymore public than it already was, it did extend the controversy into the realm of sports. A realm that for many, is off limits from politics and the chaos of everyday life. Sports, after all, are our escape. Sports and history are two areas where we often go to getaway from the realities of current events. Many fans deplore the idea of politics getting mixed up in their sports. Athletes too, avoid the subject. During the 1990s Michael Jordan famously refused to endorse a North Carolina Democrat because “Republicans buy shoes too.” MLB’s actions regarding the Baltimore Orioles game, made the conflict inescapable and unavoidable. It made it inescapable in multiple ways. First, it further thrust Baltimore into the news and supported narratives of the protests as violent and dangerous. After all, the simple rationale behind the decision was that the city was too chaotic and unsafe. Coverage expanded from traditional 24-hour news sources to 24-hour sports channels. Traditionally front-page headlines invaded the sports section. You could no longer turn to the sports section first, like Earl Warren famously said he did, to avoid reading about man’s failures. Second, MLB’s decision took away a place for physical escape. The league cancelled games, rescheduled some, and moved others to different cities citing safety concerns. The league prohibited fans from attending an afternoon game in Baltimore on April 29th. On that afternoon the league prevented its fans from taking a day off, leaving the streets, ignoring the perils of their lives to catch a baseball game. To be sure, the game was on TV but fans were unable to enjoy the quaintness of the pastoral game as they walked through stadium tunnels to their seats in awe of the lush green outfield that contrasts so starkly from the concrete and bricks of the urban core. Fans were devoid of the timeless experience of innings unfolding naturally without commercials or talking heads. Instead, they were forced to face the realities of modern America and the problems of their city. It was an eerie experience. No major league baseball game had ever been played without fans (or at least the opportunity for fans) in attendance. In a game so filled with nostalgia and respect for the past, it was a milestone that rejected so many of the things that make the sport America’s past time. It was also a rare rejection of capitalism. 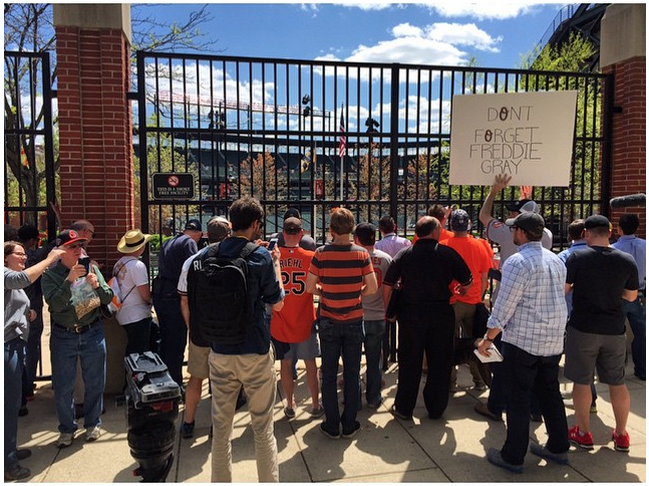 MLB and the Orioles turned away thousands of paying customers, revoking their access to public spaces. Liability and the fear of potential litigation overwhelmed their greed. Outside of the immediate eeriness of a game played before empty seats, and the outrage that a tax-supported stadium could be closed to the public by a private entity, is a larger social script at work – a script where our value, our citizenship, and our voices are increasingly dependent on our consumer power. Inside of that script is the realization that our access to the public sphere, through the role of consumers, now comes with a predetermined set of social relations. Private property becomes the site of our public space, with the social functions carried out in that public space dictated by private entities, ever ready to regulate the behavior of consumers. Boycotts, strikes, and picket lines are tried and true methods of social reformers, but underlying their use is a common assumption, namely that we, as citizens, access the public sphere through our role as economic actors. Pocketbook politics has become the norm. This makes perfect sense, given our economic order, but it reveals a shortcoming. Does Chick-fil-A violate basic human dignity by pushing for anti-LGBTQ policies? Does Hobby Lobby represent a darker time when women were forced into back alley abortions? What ethical boundaries do small business owners in Indiana violate when they deny service to gay couples on their weddings? These are fascinating questions, but a more pressing question is how do people respond? Are we good citizens simply because we shop at the right place, patronize the businesses that agree with our cultural politics, and vote with our credit cards? Will we buy ourselves into a better world? Is our relation to the public determined by how we consume? If so, we begin to see the limitations the Baltimore game makes clear. What do we do when corporations boycott us? 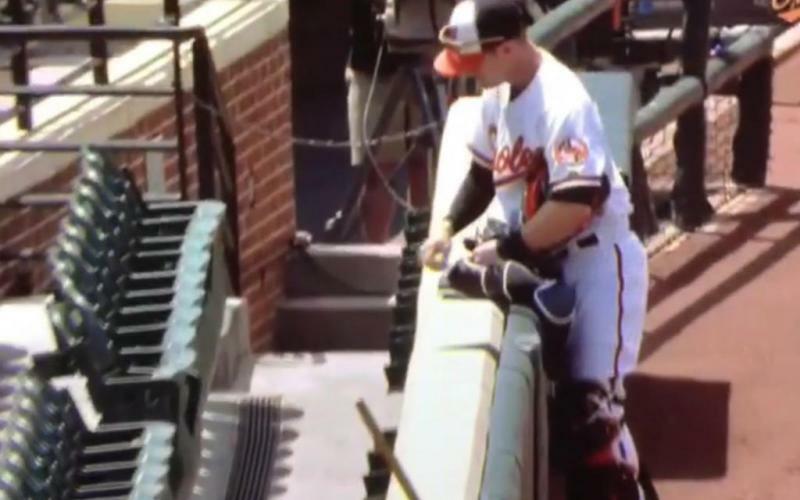 Orioles catcher Caleb Joseph signed imaginary autographs prior to the game. The game played on, not out of eerie obligation, like some forgotten robot left on a forlorn world, instead the game played on because baseball, and all of its public appeal, is wrapped up in the obligation to deliver a product. Although no one was in the stands that day there were plenty of spectators. Viewers at home watched on their televisions and computers. The MLB promised so many games, and true to its promise it made an effort to deliver. Rome burned and Nero fiddled. Baltimore burned and we played ball. Access to the public space was, therefore, made possible through the act of consumption of internet and cable. But of course this is just a technological expression to a common reality. The ballpark, as a “public” space, is only accessible by buying. What this event in sports history represents is a society that sees sites of capitalist consumption as arenas of the public. Much like interstates are realms of the “public,” we are only able to access these areas by taking part in capitalist consumption. For the ballpark it is the price of an MLB ticket, subject to negotiation if the owners of that public arena feel threatened. For the interstate it is being forced to buy an automobile, insurance, gas, and upkeep of a vehicle. We are public people in these arenas only if we are consumers. With such a thought in mind it is not difficult to understand why the teen protester who smashed a police car window had a higher bail than the police officers who killed Freddie Gray. One represents a loss of life that the court will determine whether or not wrong doing occurred. The other is an assault on the basic principle that props up our society— property. As protesters in Cleveland continue to use the shutting down of traffic to enact nonviolent civil disobedience, and the Baltimore game of April 29, 2015 enters the annals of sports history, we are reminded of the ways in which sports and leisure highlight the tension of social development. In a society that uses consumption, based on economic power, as a means to control who can enter public spaces and shape narratives, we are shown the basic inequalities undermining our civilization. Standing in these public spaces is not formed on the basis of equality. It is based on economic inequality. Poverty keeps people out, money allows people in, and a lot of money allows people to open or close the space as they see fit. As Baltimore burned, the Orioles won their game. We, in turn, were left wondering, who would win in the larger struggle outside the stadium? We were left wondering, who would be the faces in the crowd, and who would control their entry? Thanks for a thought-provoking post. I’m surprised that you did not include John Angelos’s statement about the Baltimore situation. It was a rarity and a compelling summation of the Gray situation and the long legacy of Baltimore’s economic situation from a very liberal perspective. Sorry I haven’t replied sooner, Brett. John Angelos comments are indeed interesting. I think he’s a complicated figure. He shows a keen awareness of the larger problems in Baltimore, and around the U.S. It’s unfortunate that he seems reticent to take a stand. He makes it sound like several of the decisions were out of his hands, but probably would have gone along with them. The Angelos bought the team (in bankruptcy court) in 1993, after they moved to Camden Yards. Unlike other ownership families, they are lawyers, not businessman, which I think gives them a different perspective. They are also a Baltimore family. Local ownership is important, and several teams don’t have that. While these distinctions are important, the timing of the purchase hints that they weren’t necessarily involved in the original spacial reorientation of downtown. They have, however, profited handsomely from it. And that’s why Angelos comments are tricky. He understand the complicated nature of the events, but his own business profits from the spacial and economic alienation of the neighborhood. Despite all of his awareness, he’s contributing to some of the problems.